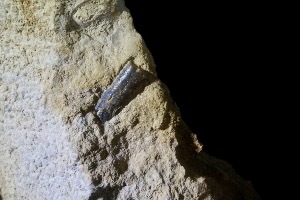 Cylindroteuthis is a species of belemnite that lived from the Early Jurassic to the Early Cretaceous. 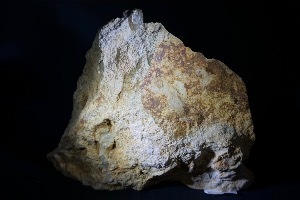 Fossils of Cylindroteuthis have been found in Asia, Europe, North America, and New Zealand. 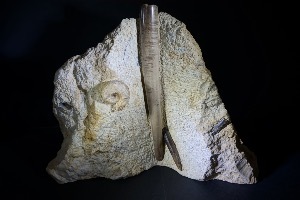 Cylindroteuthis lived as a predator in the deeper parts of shelf seas and was one of the largest species of Belemnite, growing up to 25cm (10 ich) in length. 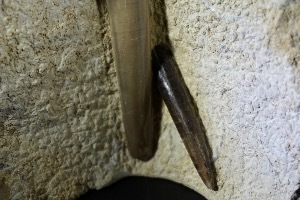 There are three Belemnite in the matrix, sizes are approximately. 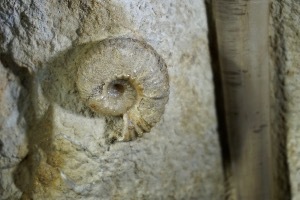 Stephanoceras has an evolute shell, as characteristic of the family, with well-developed ribbing and tubercles. The shell is coiled so whorls barely touch in most, but some have notable overlap. 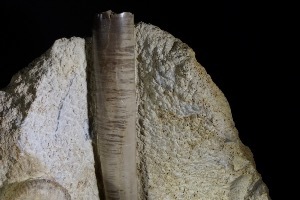 Primary ribs emerge from the umbilical seam, the line marking the inner edge of the particular exposed whorl, and divide on the flanks, usually in two, occasionally in three, forming secondary ribs that cross the outer rim of the shell, known as the venter, uninterrupted. Turbercles, elevated projections, form at the ends of the primary ribs where they bifurcate or sometimes trifurcate. 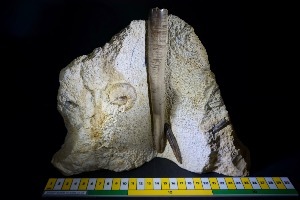 Stephanoceras grew to be fairly large with a shell diameter as much as 27cm and width as much as 6cm across the outer whorl. 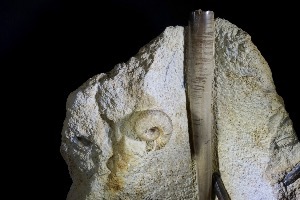 Like many if not all ammonites, Stephanoceras is dimorphic with a large, macroconch, form thought to be female and a small, microconch, form thought to be male. In most aspects the microconch is simply a smaller version of the macroconch. The primary difference lies in the aperture, which in the microconch has planar extensions on either side, lappets. That of the macroconch is generally simple, preceded by a constriction.